Click the chart for more market data. NEW YORK�(CNNMoney) -- Stocks retreated broadly on Friday, with the Dow ending below 12,000 for the first time in three months and the Nasdaq erasing all of its gains for the year. Insurance and financial stocks started the selling spree, but it quickly spread to all sectors. Commodities were hit hard. Oil and silver prices slumped nearly 3%. Late in the session, bank stocks turned higher, helping the broader market pare losses. The Federal Reserve issued a proposal to increase capital requirements on large banks by 5%, which was far less than investors feared. Shares of Bank of America (BAC, Fortune 500) and Goldman Sachs (GS, Fortune 500) rose 1.5% each, while Citigroup (C, Fortune 500) and JPMorgan Chase (JPM, Fortune 500) also edged higher. But the rise in bank stocks was simply not enough to help the broader market. 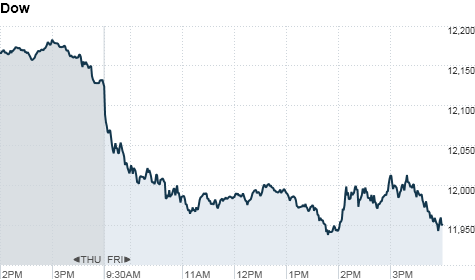 The Dow Jones industrial average (INDU) fell 172 points, or 1.4%, to end at 11,952. Travelers (TRV, Fortune 500) was the biggest drag on the blue-chip index. The insurance company warned that it faced $1 billion in catastrophic losses related to the storms and floods in the Midwest and South, and said it would slow its stock buyback program. The selling spilled over to other insurance stocks. Allstate (ALL, Fortune 500), Metlife (MET, Fortune 500) and Principal Financial (PFG, Fortune 500) were all down 1% or more. The S&P 500 (SPX) slid 18 points, or 1.4%, to close at 1,271; and the Nasdaq Composite (COMP) fell 41 points, or 1.5%, to 2,644. "There's a lot of emotion in this market at the moment, and the conversations among traders are nearly all leaning toward the bear side," said Frank Davis, director of sales and trading with LEK Securities. Friday's retreat comes a day after stocks snapped a six-day losing streak. Sentiment remains decidedly pessimistic. "A lot of us shook our heads as the market headed higher, despite higher energy prices, the economy and the turmoil going on abroad," Davis said. The Dow and S&P 500 fell for the sixth-consecutive week. Currencies and Bonds: The dollar jumped more than 1% against the euro and gained 0.6% versus the British pound. The greenback edged lower against the Japanese yen. The price of the benchmark 10-year U.S. Treasury rose with the yield at 2.98% compared to 2.96% late Thursday. Influential bond investor Bill Gross appears to be re-entering the U.S. Treasury market, albeit slowly. Gross' PIMCO Total Return Fund (PTTRX) increased its holdings of U.S. Treasuries to 5% last month, from 4% in April, according to Pimco's website. Earlier in the year, Gross had been shorting Treasuries, saying artificially low yields had made Treasuries an unattractive place to invest. Bond prices have been rising over the past two months as investors sought some safety amid the recent stock slump. Companies: Toyota (TM) released its forecast for fiscal year 2012. The auto giant said the fallout from the March earthquake and tsunami will continue to hurt sales and cause supply disruptions across the industry. In its report, Toyota said it could lose $1.6 billion in profits in the current fiscal year. The automaker said it also expects consolidated net income to drop 31% to $3.4 billion in the next fiscal year. Toyota also forecast operating income to drop about 35% for the next year, based on current exchange rates between the yen and the dollar. Lululemon Athletica's (LULU) stock rose 4% after the maker of athletic clothing reported a profit that topped estimates and raised its outlook. Shares of Fusion-io (FIO) extended their rally, rising 6%. Fusion-io made its public debut Thursday after raising $233.7 million through an initial public offering. Online music streaming company Pandora said it would sell a total of 14.7 million shares through its previously announced IPO at a price range of $10-$12 a share. Avaya, which makes telecom equipment, filed Thursday to raise up to $1 billion in a public offering. The company joins a crowd of tech companies rushing to take advantage of a friendly IPO climate. Ally Financial, formerly the financial services arm of GM (GM, Fortune 500), has decided to delay its $5 billion initial public offering, according to reports. The company has been owned by U.S. taxpayers since GM was rescued by the government in the recession. Economy: The government reported that import prices for May rose 0.4%, excluding oil. That comes after a 0.6% increase in the prior month. Excluding agriculture, exports increased by 0.5%. That followed a 1.0% increase in April. The Treasury Department reported that the federal budget deficit for May was $57.6 billion and $927.4 billion for the first eight months of the fiscal year. World markets: European stocks turned lower. Britain's FTSE 100 dropped 1.6%, the DAX in Germany fell 1.2%, while France's CAC 40 tumbled 1.9%. China's monthly trade balance showed a wider surplus in May, although the rate of export growth slowed. The world's second largest economy reported a $13.05 billion surplus in May, up from its $11.4 billion surplus recorded in April, China's General Administration of Customs said Friday. Asian markets ended the session mixed. The Shanghai Composite rose nearly 0.1%, and Japan's Nikkei advanced 0.5%, but the Hang Seng in Hong Kong fell 0.8%.